MTC’s Literary Director Chris Mead takes a look at the cross-section between Lorca, Cornelius and Cáceres’ work. For many, Federico García Lorca is an undisputed modern master. A playwright of international repute, most particularly for his three brilliant tragedies (Blood Wedding, Yerma and Alba), wrought from the raw material of Roman Catholicism and lyric Latin poetry, his profound love of modern music (he adored Debussy, Chopin and Beethoven), rural Spanish folklore and women’s yearning, rage and insight. A poet and a visual artist to boot, Lorca chronicled a Spain in transformation. He is perhaps most famous outside Spain (where his work was banned for years) for dying absurdly young, executed by firing squad fighting the fascists in 1936. His body has never been found. Patricia Cornelius is a writer well-known for her many awards, her fearlessness and forthrightness, and for a body of work that relentlessly dissects capitalism, feminism and their brutal collision. 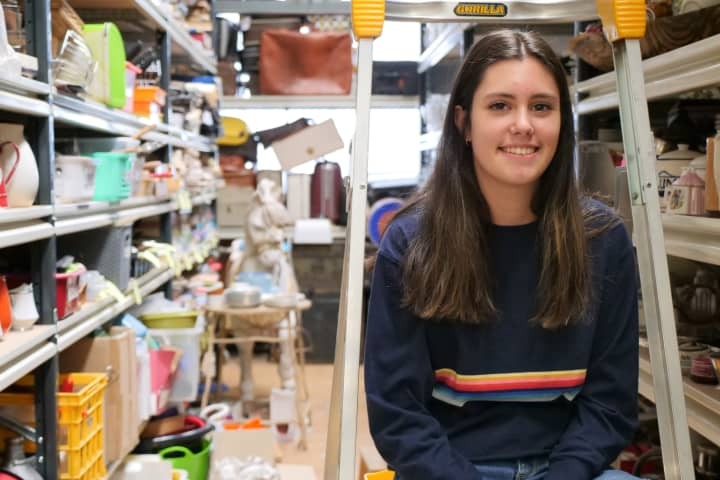 Plays whose titles alone cause consternation, outrage and rich conversation, Patricia finds poetry in squalor and a fierce autonomy in those too often portrayed as voiceless and without agency. Her plays document sexism, false ideologies and cruel power struggles, but also tenderness and rare intimacies. 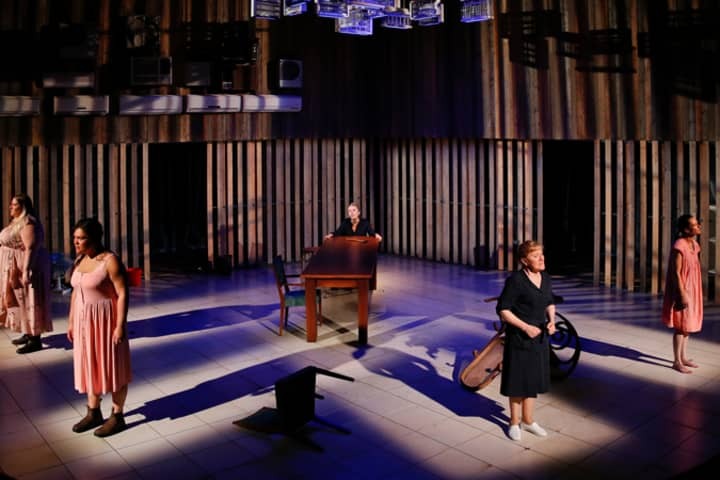 The House of Bernarda Alba begins at a wake, the beloved Alba patriarch has died. In the original, the widow asks her household to mourn for the lost paterfamilias for eight years. 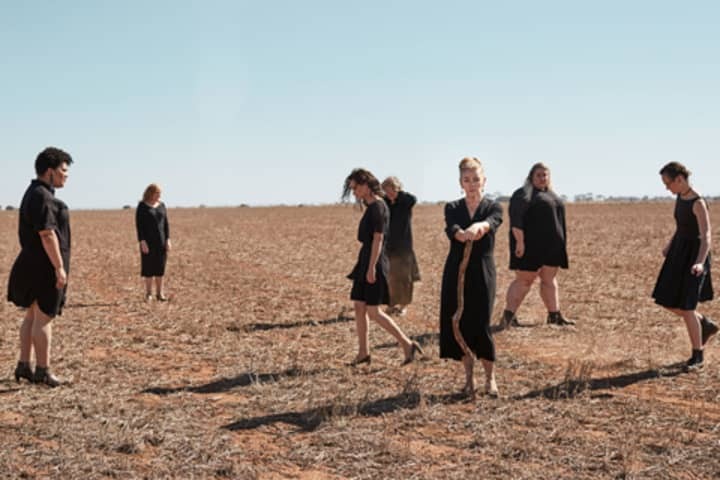 The play then takes place in the sinuous, agonising and tormented years that follow, in a house made up of seven women. That there are seven women on stage is remarkable since Alba is the first play written only for women actors. The list of all-female plays, as a side-note, is a sadly short list of around 50 plays. MTC has produced a number from it, including Top Girls (2012) and Di and Viv and Rose (2016). 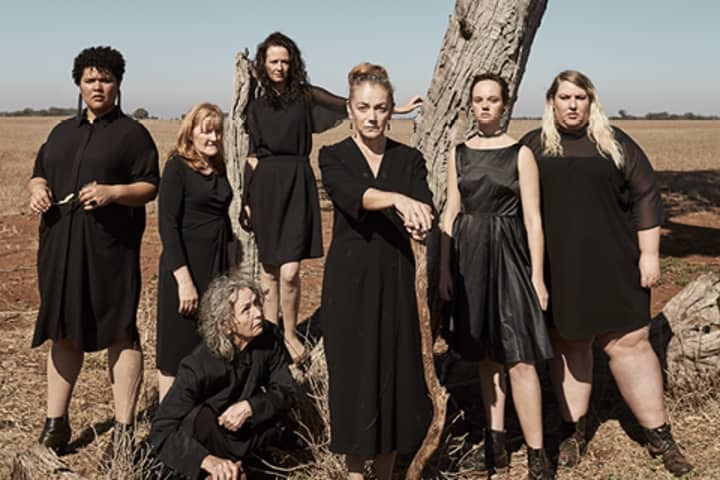 It is a list that also contains Australia’s Dymphna Cusack with her Morning Sacrifice, written just six years after Alba and more than likely the second play ever written only for women. Patricia Cornelius has shifted the action of the play from 1930s rural Spain to Australia of today. Instead of a verdant, acutely Catholic and an almost pre-modern world, here is a palace of dust in thrall to the worship of mining and money, and young modern women appalled at not only having to stay home for a fair whack of time, but galled at having to do so with no phone and no internet. We so often forget that many plays which we receive as classics, as here with Lorca, or indeed with Chekhov, or much of Ibsen and Strindberg, and many of the ancient Greeks, that they were written steeped in the language, concerns and details of the period in which the playwrights lived. The first Act of the play clearly establishes the threats to the family from without, not simply the danger to the family business and fortune, but the fact that it is a family consisting entirely of women, and mostly of daughters, seeming prey to scoundrels and sharks. It is in the second Act that the danger shifts much closer to home. And worst of all, Alba’s house, she discovers does not belong to her at all. This discovery is the subject of powerful drama, but Patricia has also found much that is mordant and wickedly funny. The four daughters, and Bernadette Alba’s friend and housekeeper Penelope, not to mention her wayward mother Maria, don’t simply get on each other’s nerves, they are mischievous, difficult and relentlessly incendiary. Her friend and confidante Penelope notes drolly: ‘Girls get feisty without men’. As for Bernadette herself, played with fierce grandeur by Melita Jurisic, she is a force of nature, a charming and poisonous despot; a basilisk; a cruel and humiliating tyrant determined at all costs to retain control of the fortune, the business and the House. Patricia has thought deeply about her drives and her will to power, ‘a woman who can maintain control and keep her daughters captive for eight years is pretty hard to conceive in its context, let alone now’. It’s a fight Bernadette must win, and for Patricia the playwright to ‘win the severity and control of that woman in contemporary times is difficult.’ It does present, however, a thrilling theatrical challenge nevertheless. 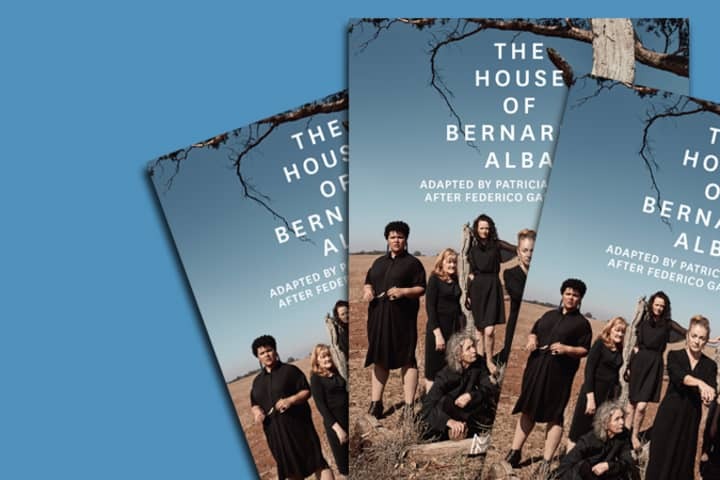 The House of Bernarda Alba adapted by Patricia Cornelius after Federico García Lorca plays at Arts Centre Melbourne from 25 May.